By default on an Oracle RAC installation, the listeners are configured to allow any database to register with them. There is no security out of the box to determine which databases may register. While this makes it easy to create new databases without worrying about listener registration, this can cause potential problems in a real environment. 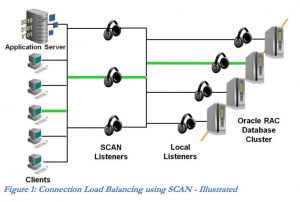 SCAN listeners are designed to accept registrations from database instances, no matter where the registration is coming from. For example, imagine an 8-node Oracle RAC system with dozens of 2-instance databases spread throughout. Thanks to the LOCAL_LISTENER parameter setting, the instances will register with the listener on the node where they reside. If the REMOTE_LISTENER parameter is set to the SCAN hostname and port, they will also register with the SCAN listeners throughout the cluster. These registrations will occur no matter which node the SCAN listeners reside on – they are configured to accept registrations from anywhere. More on this problem in a moment. Whether deliberately malicious or unanticipated, listener poisoning can have detrimental effects that can sometimes be very difficult to diagnose. In some cases, a database on a remote cluster will register with a different cluster, causing connectivity issues. Worse, a database with the same name could cause production traffic to go to the same service on another cluster entirely, causing unexpected issues. Initially, the solution to this problem was documented in MOS note #1340831.1, which required configuring a wallet for the listener, and secure TCP communication between database instances and the listener. Thankfully, Oracle now supports Valid Node Checking for Registration, or VNCR (MOS Note #1914282.1), in versions 11.2.0.4 and up. Setting this up requires a few parameters in the listener.ora file and bouncing the listeners. Here’s an example of what this looks like in practice. 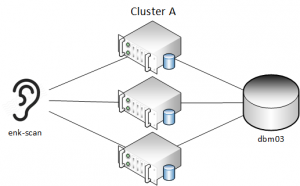 We have 2 RAC clusters, each with their own SCAN hostnames – Cluster A (enk-scan) and Cluster B (enkx4c02-scan). 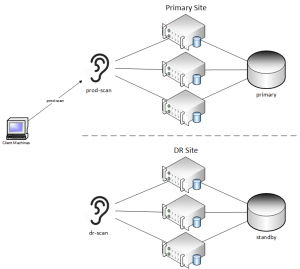 Each cluster has a database named “dbm03” – they are both primary databases that have different data. As you can see, both databases have the same name, but different data in T. Now, what happens to the database in cluster A if we change the remote listener parameter? Even though the dbm03 database is up and running on Cluster B, new sessions to the dbm03 database that go to enkx4c02-scan go to the database on Cluster A. This is definitely not what we would want to happen. As mentioned before, DNS records are changed during a DR event. By only changing DNS entries, the applications do not need any changes whatsoever. This can lead to easy switchover operations, as DNS changes can be automated very easily. As you can see below, client machines will be directed to the DR site, but the primary site will still utilize the prod-scan hostname as well. This will work without an issue if there is an actual failure on the primary site, but what if databases come online at the primary site, and still attempt to register their service names with the remote listener? 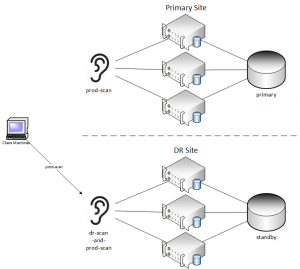 DNS will resolve the REMOTE_LISTENER parameter to the DR site and perform registration. The client machines will be accidentally directed back to the primary site, which may have databases only running in mount mode. TNS-01182: Listener rejected registration of service ""
By setting this up, you are able to ensure that there won’t be any intentional or unintentional listener poisoning going forward.